The exhibit of Renaissance portraiture that was on view at the Metropolitan Museum of Art some years ago allows a reconsideration of the tag line from Jacob Burckhardt that the Renaissance saw the birth of individualism. Commentators and art historians at the time of the show invoked Burckhardt as a way to explain what this show was about, even if they used Burckhardt as little more than a mandatory reference: oh yes, his name has to be mentioned, and if the show is not about individualism, what could it be about? Well, it was about the fact that some very, very beautiful pictures had been created; that’s what it was about. Look at the pictures rather than treat them as way stations in intellectual history. Moreover, instead of playing the game of periodicizing art, let us now be analytic and so associate different aspects of art to different aspects of individualism, presuming the forms of individualism to be present at the same time, just as the various features of any art work, such as its subject and composition and its conventions and the external knowledge brought to a painting, are also always all there at the same time. Perhaps not all concepts can be broken down into these four parts, but individualism certainly can be. If that is the case, that the concept of individualism has all the elements that go into visualization, then that is evidence that individualism is not just a concept but a description of something that actually exists in that it can be visualized, while other concepts, such as justice and God, cannot be visualized, and so perhaps do not exist at all. The first meaning for the term “individualism” is that attention is paid to the distinct person, the someone who is other than a member of a crowd. The person is out there occupying space in the universe. This meaning requires the viewer to come to grips with what that person looks like as opposed to what some other person looks like. The person whose picture is interrogated is the person who appears in the material world. The portraits in the Met show, consequently, can be compared on a number of dimensions having to do with the physical characteristics of their subjects, some of which are the standard demographic characteristics of age, gender, ethnicity and wealth (there are few pictures of poor people). The most significant comparison, however, may be on a dimension not usually considered demographic though it might as well be because it is distributed differentially across geography, and that is beauty. Women in Paris and Rome look great while women from Appalachia look washed out at an early age. Those are just the facts, and so beauty does not get treated as a demographic characteristic because its use that way would be found insulting. The pictures at the Met were sufficiently emotionally removed from us that its subjects can be arranged on a scale from the near ugly to the very beautiful. Ghirlandaio’s Portrait of an Old Man and a Boy (ca. 1490) shows an old man and a male child looking into one another’s eyes. They invade one another’s body space in the way affectionate grandchildren still do with their grandfathers. Scholars say that the portrait of the old man is based on a death mask of its subject, but he is made to seem alive enough. His face shows some ravages of old age. There is a mole on his forehead and his nose is distended with puffy parts that scholars say was “rhinophyma”, whatever that was or is. I wonder if that was a common ailment among the Renaissance elderly or if the artist was just being accurate to this particular subject or whether, and this strikes me as most likely, the artist was trying to find some disfigurement that would reveal old age without making the old man too hideous. The young boy is looking at the old guy with interest rather than dismay or disgust, just as present day young people might do when they get a close look at what an old person looks like. The young boy is a mirror image, except that his nose is pert and his skin is absolutely clear, as if he was looking into what he would become just as the old man was looking at what he had once been. So this is a picture of age and youth, a proper contemplation for either party. Each of the two inhabits their bodies comfortably. They are what they seem to be rather than an invitation to ask what they are thinking deep inside about what they are, as if the old man were screaming for his young self to get out or the boy pondering the inevitability of aging. Those kinds of reflections are centuries away. The contrasts are on the surface. The old man has big ears not covered by his thin gray hair while the boy’s ears are covered by his blonde hair worn long. So there is a contrast in the way old and young are presented, the customs that go along with their appearances, and not just a contrast of their state of physical development. At the other extreme is Botticelli’s Ideal Portrait of a Lady (1475-80). Her face is compelling, not just because of her good complexion and her well proportioned features. She has beautifully clear eyes. There is softness around her lips and softness also makes her chin appealing even though it is so small. There is even a bit of padding in the cheeks that shows her to be still a young woman, which is delicately suggested by shading, the same done with her throat. The area under her eye is large though smooth and is not baggy. She is not so much idealized as pulsing with health, her head framed by an elaborate hairdo whose theme of pearls entwined with braid is continued around her neck, her wavelets of hair also caught in that frame. A very well drawn eyebrow provides delicacy to her face because it is so simple in contrast to the many layers of the frame while connecting the face to the frame because of their shared brown color. The portrait is therefore not of an idealized beauty but of an actual person who is a beauty, even if some imperfections have been removed, because there is nothing unbelievable about the portrait or the hairdo or the dress. She is just one very elegant lady. What can be said about the portraits in the show and not just the two that have been mentioned is that there are two types of faces on exhibition. This point cuts across the distinction of gender. There are people with oval faces and turned up noses and there are people with square, heavier faces that sport thick and broad or sometimes Roman noses. Indeed, the grandfather seems of the second kind while the grandchild may not be. It suggests a bit of intermarriage between the two “races” as well as the idea that the nose makes the person. Character traits, on the other hand, such as powerfulness, are attributed to portrait figures with both types of faces. That suggests that character traits are important while the facial types serve as the background on which character is written, and that would certainly be a message of the Renaissance. A face is a given, but character is not; it is personally selected and crafted, men doing that even as women go about making themselves beautiful. A second sense of individualism, one that is separate from the distinctiveness of individual people, is the sense of individuality, which means something different about the personhood of the person, a person an assemblage of traits and attributes that make that person unique or at least very rare in the sense that other people do not quite occupy the exact same set of social roles that the person in question does. Each of us is, in the modern oxymoronic term, quite unique. Botticelli’s Giuliano de’ Medici shows the distinctiveness of its subject and not just because he has a ski nose worthy of Bob Hope. Commentators worry about whether his downward gaze is a structural feature of the picture, somewhat akin to the three quarter view of Botticelli’s idealized lady that allows a partial view of her other eye. She is staring straight ahead. What does that mean? Probably, as I have suggested, just a way of letting the viewer see how clear eyed she is. The downward gaze of Giuliano de’ Medici, on the other hand, remains puzzling because it cannot be associated with a stereotypical meaning and so may just be an idiosyncrasy of this particular painting, though there is no need for that to be the case. Maybe downward glances are a sign of shyness and so make this figure something other than the forceful people shown in so many paintings where the eyes look boldly out of the faces. A systematic investigation of whether there are a number of downcast eyes in Italian Renaissance paintings would have to be undertaken to establish whether this is a structural feature of this era in portraiture. There is another and more easily ascertained structural feature of the Renaissance portraits that does provide information about the individuality of their subjects. That is costume. The people in these paintings are well turned out and not just because they have come to have their portraits painted, though that is the case with a few of them, like Signorelli’s Portrait of an Elderly Man (ca.1510) which shows him, possibly, as a high official, as well as with Pisanello’s Leonello d’Este (1444? ), who is dressed up with his medals. Portrait subjects, though, are for the most part wearing what is for them everyday dress which is modest, mostly unadorned, and so sets up a contrast with the faces that inhabit the clothing. The faces and so, ostensibly, the characters of those portrayed are more important than their dress. The clothing is similar enough so that the faces are what set them off from one another, and the balance is clearly in favor of the face, the main object of attention of the viewer, rather than the costume, which is the main center of attention for Gainsborough. These people are not afraid to have their faces seen; they do not need to hide the faces under their rank or wealth. The clothing style itself is pleasing in that the hats and shirts are made of good material, keeping their shape, even though they are not fitted. Moreover, the style is not gaudy, as is the case with Elizabethans but has, rather a Utilitarian elegance. Elizabethan clothing was so awful that it would be a distraction if Shakespeare were performed in those costumes, while the Renaissance Italian sense of style could serve over any number of centuries. I wonder why contemporary designers don’t pick it over. A third sense of individualism is the internality of consciousness. People have a life inside themselves which may or may not conform to what they appear to be or what their roles would offer as what they should be taken to be. This is the sense of individualism which indeed becomes prized in the ensuing centuries and is taken to be the great accomplishment of the Renaissance, at least according to Cassirer as well as according to Burckhardt. What it is that gives content to this idea that people are individuals, each a distinctive consciousness, is not easily said because internality, after all, is not visible. Portraits are of faces and not of souls. Of what does internality consist, either in general or for a particular person? Portraits encourage a conversation about what people really are when viewers consult the conventions that are used in the art of a period. In the case of Renaissance portraiture, that means women are to be presented as beautiful and men presented as commandingly powerful. In both cases, an abstraction is created against which the actual face is to be compared, some universal ideal which a face tries to live up to and by doing so gives away that there is a will, some internality, which may at any given moment be at odds with the face’s presentation. That way you know there is something going on behind the face rather than only in the face. Woman can be compared to one another on a scale of beauty and are noticed by men as beautiful or not. Beauties have to deal with the fact that they are beauties, just as ugly women have to deal with the fact that they are ugly. 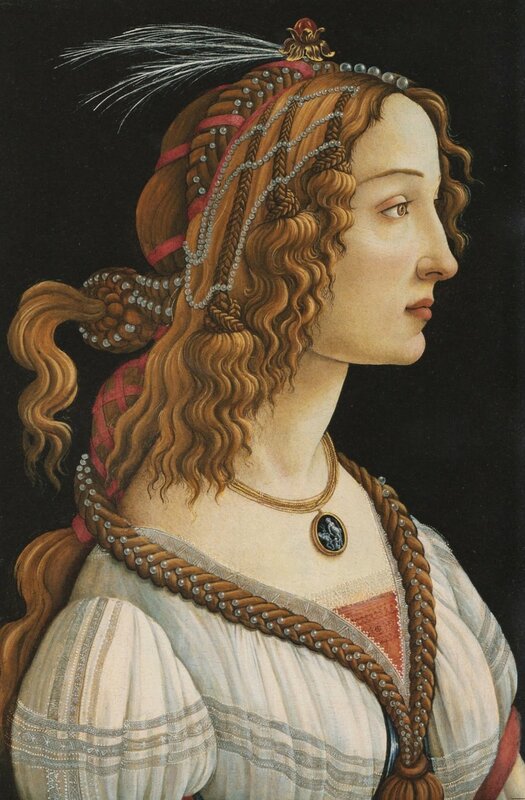 Botticelli’s idealized woman has to deal with her beauty, which means she can choose to dress it up or not, can think of herself as beautiful and as appreciated as such or not. That is an existential choice, not a cultural one, which means it has always been with us. There are beautiful women in Egyptian art and there are beautiful women in Christian art. And so we can always ask the question of how people respond to this given about them. The idealized woman seems to embrace her beauty by cultivating its frame, setting that frame against her face, and seems to be poised in her forthright look. She is not shy about her beauty but inhabits it. It may be characteristic of Renaissance portraits that the people are self-conscious in a most unself-conscious way: there is no hemming and hawing; they are just being what they are. There is the possibility that in another culture their selves will not be so available, though the question of whether they are available is existential rather than a matter of a particular culture. There is a particularity of self hood in these Renaissance portraits that is not of the same quality as will become prevalent in the Eighteenth Century, when people are indeed tremendously self-conscious and uncertain about where their consciousnesses will lead them. Fragonard’s women are coy, which suggests that they do not know if they will trot out their beauty on a given occasion. For their part, the Renaissance men whose portraits hang in the Met show are distanced from their selves by the idea that men can exercise power and not by whether they are beautiful. A man is judged by whether he exercises power or is capable of exercising it or has exercised it. The question of rank is less important than whether one’s face displays a relation to power. Baldassare d’Este’s Borso d’Este (1470) raises the question of whether this ruler has been involved in too many murky matters. The same is true of the very differently shaped face in Foppa’s Giovanfrancesco Brivio (1495-99). The ravages of power or anything else in life on a face is an existential matter, even if historians and other writers make a fetish of the Machiavellianism of the Italians. The postures of the subjects of Gainsborough portraits, on the other hand, all have the same swagger and firmness of lip and spine that is attributed to noblemen, but it is the clothes that make the man, not his face. The powerful men in the Renaissance are therefore a drama in which their presentation is at war, if it is at war, with their power. How do they grasp onto presenting their power and how is a viewer to grasp their personalities? The question rather than its answer is what bespeaks internality. That leads to the consideration of a fourth kind of individualism, which consists of thinking of society as the interaction of a set of individual or atomic units, each one of them warring with one another (the Italian choice) or cooperating with the others (the French choice) to produce the resultant society. The impact of human wills upon one another is stronger than any impact at a medieval tournament. Governments at the time of the Renaissance and shortly thereafter come to be understood as composed, somewhat indirectly, of the actions of their citizenry or their subjects rather than imposed on populaces from on high. Machiavelli’s prince has to respond to the masses so that they will fear him because otherwise they might overwhelm him. Even Hobbes, the authoritarian, is actually saying that governments are created so as to serve the people by providing social order and that if they do not, the people will withdraw their consent and create alternative governments. How is atomic individualism represented in painting? It is not evidenced by something happening within the painting but by something brought to the painting. We know from art historians that these are not just portraits of powerful looking people. They are portraits of people who were powerful. These are the makers and breakers of their society, oftentimes replacements for an official royalty. The power broker holds the power and needs no throne holder to dress that up. The clothes these powerful men wear are well cut but muted, without decoration to reveal their status. That alone is enough to reveal their power: that their power can be naked. Women may have to be dressed up so as to properly frame and display their beauty, but men who are feared just look fearsome. That is a revolution if there ever was one, and so suggests that history and the history of art, unlike the components of a painting, can indeed be periodicized. That is because, first of all, the paintings of a particular period have a lot in common. The various factors that go into an art work or that go into individualism do not vary very much in the course of the Fifteenth Century in Italy, at least as the history of portraiture is reviewed in the Catalogue to the Met’s exhibit. The earlier pictures are a bit less accomplished in execution, but that is about it. There are beautiful people early on and later on, though the portraiture of women seems a bit earlier than the portraiture of men, but that may be only a result of the fact that the paintings selected for reproduction are not a random sample of portraits done during the period. Another feature of periodicization is that there is a sequence of periods in that the various periods each have a particular way the various aspects of art hang together and the same can be said of the relation of the ideas of a period to their various visualizations. That is certainly true with the Italian Renaissance. Georg Simmel, for example, disagrees with Burckhardt not on the matter of whether there are periods but on when individualism truly begins. Georg Simmel thought that atomic individualism was a concept all its own and predated individuality and internality. He had in mind the fact that Hobbes and the other Seventeenth Century philosophers were atomic individualists and that internality flourished as a subject for discussion in the Nineteenth Century. But Simmel also remarked that he thought the Italian Renaissance was individualistic in the sense of focusing on internality because its projection of power allowed leaders to think of themselves as distinct from the masses and from the mass mind. A guy who gains power is therefore filled with an internality that comes from his having honed himself to think he is special. The important point is that within a period one aspect of portraiture gives nuance to another aspect of portraiture. A distinct face looks different when it is enshrined by power, as if this face too were capable of being one of the powerful, a lesson learned over and over again as new faces and kinds of faces rise to power. Barack Obama is now the face of power except for those who believe he is somehow illegitimate if for no other reason than that a black face cannot be the face of power. That revolution in consciousness about what it is to be an American has come about during the past four years, never mind other aspects of racism that still linger, and never mind that not everyone has accepted that Obama’s can be the face of power. So it is understandable that all of the varieties of individualism are seen to hang together and get morphed into a single thing, though one should think that scholars would feel the need to keep the different strands separate for analytic purposes. The same thing that happens in portraiture also happens in reality. People in their social lives go through the same four processes of making descriptions, noting structures and the variations on a convention, and applying outside the frame information to people one meets as well as people one already knows. I met some new friends of my wife recently. They are heavy set, a bit stooped, and show other signs of being of the same age I and my wife are. The women have no waists; the men have no hair. They sit around the dinner table trying not to drop the plates of food they are handing around; they talk about their displeasure with their children even though we have all barely met. It is conventional to do that. They are stereotypes of old people, and what I bring to the picture is the fact that we all know we aren’t getting any younger and that our infirmities will get worse rather than better. On the other hand, when I look at old friends my age, I see the faces I have known for forty years, and so those people are not as subject to their stereotypes. They exist to me, even in their faces, as composites of when they were younger with what they are now and so are ageless. That is not to avoid picturing them. It just requires rendering them as Picasso did, as having multiple layers superimposed on one another, or rendering them as Lucien Freud did, in their full fleshiness, the person still there. Either way works, but neither is the way a Renaissance painter would have done it.